Bit Tech reports Shin-Etsu Chemical claims to have designed a new LED that offers longer-life and better brightness than currently available LEDs. The product used a new silicone encapsulating material that promises to ensure superior brightness through increased transparency and a lower refractive index than other encapsulating materials. Sadly, they're not perfect: despite promised lifespans of thousands of hours, various issues - thermal cycling, gas permeation and others - conspire to send LEDs dark before their time. 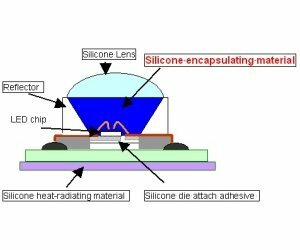 Shin-Etsu's solution to the problem is a new silicone encapsulating material which it claims boosts reliability while ensuring superior brightness through increased transparency and a lower refractive index than other encapsulating materials.